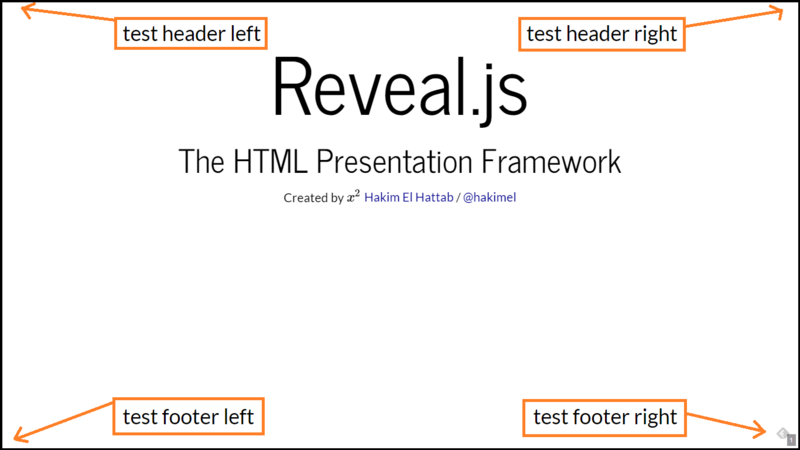 Now as far as I have understand reveal.js uses fixed size for the presentation by default with a width of 960px and height of 700px. This size is completely fine to me. However, I want the headers and footer not to be fixed in this window. They need to adapt to the actual screen size. That is to say, I want the left header to be aligned to the top left corner of the screen. Likewise for the other header and footers, see also the image. How can I achieve this? Currently it seems that my headers and footers are fixed within the default window (960x700). Add the elements to the slide-background <div> (instead of section, slides, or reveal). This <div> is dynamically generated, so we must wait for the Reveal.js ready event. When printing there is a slight delay followed by unnecessary animation of the headers and footers moving into place, but all the headers/footers are rendered in the PDF as desired. Style header/footer <div> so they are positioned as desired.